At the end of my viewing of Avatar, the audience all clapped. They clapped because the human race fell to a society of extraterrestrials. Why is this? Are humans beings discontent with the world they inhabit, with themselves? 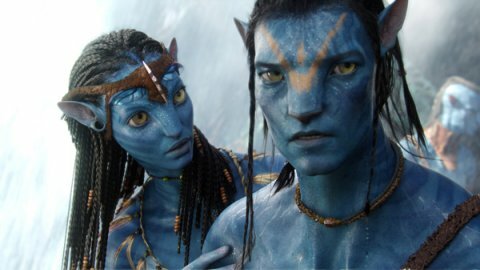 In Avatar, human beings set out to obtain a precious commodity called unobtainium that exists on another planet named Pandora. Unfortunately, this prized material is found in great abundance directly on the land that the Na’Vi (the indigenous peoples of Pandora) inhabit. Thus, after perfunctory attempts to befriend the Na’Vi, the human beings attempt to destroy the Na’Vi people and claim their fortunes. That’s the general plot. But what interested me more was the subplot and why people clapped at the end of the movie when the greedy humans are destroyed by the Na’Vi people after a vicious battle. In this clapping, people are essentially applauding the destruction of themselves. A bulk of the nearly 3 hour movie is taking up with the subplot, which is about how the Na’Vi people live. The Na’Vi people live in communion with nature. They physically connect themselves (through their tails) to living creatures of all kinds, from space-age horses to plants that record the history of the Na’Vi people. When they have basic needs, like self-defense or hunger, they apologize to the beast that they are required to kill for these needs. Their days consist of frolicking through their lovely paradise and living–virtually naked–in the beautiful moments that nature has graciously provided. And so, when the heartless humans pursue their precious commodity at the expense of the Na’Vi people, the movie audience chooses tranquility over progress. However, humans–you and me–have not made this choice outside of the cinema. We choose progress over nature; we choose progress at the expense of nature. By our complicity and purchases–TVs, iPhones, houses, cars, diamonds–we are actively rooting for the destruction of this tranquil life. Through our telling applause, is it not reasonable to conclude that we pursue a life, an existence, that we do not really want? Are we addicted to things that are not the thing we really want? To me, these questions are the secret success of Avatar. Ironically, I wouldn’t be asking these questions were it not for this movie, the most expensive, progressive, and technologically advanced movie ever made. Richard CummingsAvatar Review: The Discontent of Humanity? good review, i wouldn´t have thought of this without having read this article, we were all on the Na´Vi side during the movie but we are all doing the same than the humans were doing in the movie, leading the planet to its end. It was a fascinating one, and it made us all think about how we are, it looks like all the movies lately are focused on make us see how we are, and why we have reached to where we are and even worse, many of them show as how we are going to end due to our greed and many other behaviors. P.s: I want to ride one of those toruk macto whatever. You raise an interesting point, at the aggregate level, humanity pursues technological advancement and economic productivity, while failing to acknowledge that it is not we truly require. Humans take this path of self-destruction because we are forced to under the present state of affairs, sadly it is how our world and collective mind has developed, though it is not our essential nature. Also do not make the mistake of over-generalizing…you tend to lump all humans into one category, in your analysis, and I fear you may be doing this in other analyses as well. The end of Avatar was not a symbol of Human defeat, it was a depiction of justice and reason triumphing over greed. There were good humans in the film as well, just as there are humans in today’s world that value peace and harmony over materialism and power. In many ways it was a symbol of human achievement, in that it illustrated how even in the future, virtues of empathy and understanding still exist among many humans. Also, the whole movie was kind of a metaphor for imperialism and colonisation (ie, the aliens aren’t really representing actual aliens, only a repressed population, and the humans are not actually representing humans, only an oppressive force). judging by the appearance and style of the Na’Vi, it’s seems most like a depiction of European imperialism in the 1800s. I’m rather surprised you didn’t catch that.